A year-and-a-half ago in Kansas City, Loren was on his family’s front porch after church when he was struck in the face by a bullet. He’d been caught in the crossfire of a shooting that had nothing to do with him, but his life changed forever. About to graduate from high school, Loren had been talking with a recruiter and was eager to join the marines. After extensive medical care, managing to finish high school and some initial blindness rehabilitation, Loren arrived at the center in late January for nine months of our intensive, comprehensive training. When Loren graduated from our program in October, his life had changed once again. Having traveled all over the Denver Metro area, he has the skills and confidence to travel anywhere he wants to in any city. He can read and write Braille, and loves using the slate and stylus. In tech class, he had to start from scratch in learning the keyboard by touch, but now is proficient using multiple productivity apps both in Windows and on his Android phone with assistive technology. Always an athlete, Loren relished the challenges of downhill skiing and rock climbing, and excelled in our 8-week martial arts class. For his graduation day, he planned and prepared a meal for sixty people. Several family members and friends traveled from Kansas City for his graduation, including the Marine recruiter he had been talking to in high school. Everyone talked about how proud they are of Loren and how his positive attitude will get him far in life. Loren is now back in Kansas City where he has a job working with disadvantaged youth. From the first, Loren refused to accept that his blindness should hold him back. Now he knows how to live the full and exciting life he wants as a blind person! Every student’s story is compelling, whether an elementary Confidence Camper in June, or a senior newly coping with blindness. We teach skills, sure, but we also impart a new, positive way to think about ourselves as blind people. 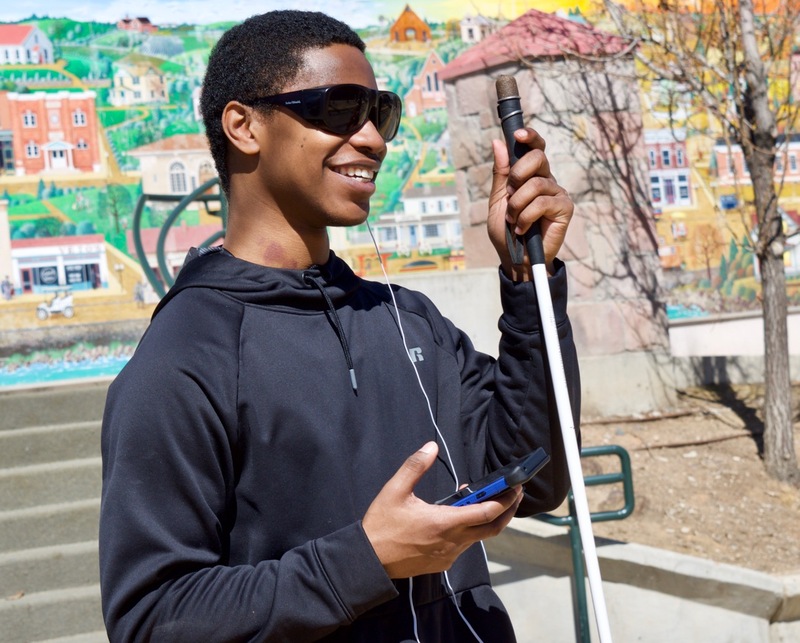 Donations, such as those from Colorado Gives Day, are necessary for the Colorado Center for the Blind to continue providing our innovative programs, characterized by the high expectations we have for blind children, seniors and working-age adults. The Colorado Center for the Blind is part of Colorado Gives Day on Dec. 4. That’s the day that the Community First Foundation and First Bank waive all but 2 percent of credit card fees and make each donation eligible for a percentage of the $1 Million Incentive Fund! That adds up to making your donations on Colorado Gives Day more valuable than on any other day of the year! What are the programs that most appeal to you, or have affected you or a friend or family member? Please support us on Colorado Gives Day, Dec. 4, or schedule your donation now to process on Dec. 4!